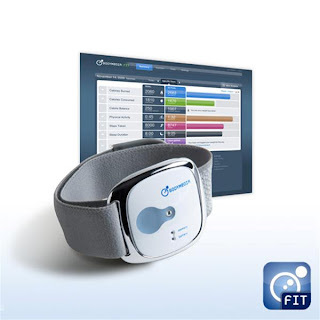 A few weeks ago I was contacted with an opportunity to take the BodyMedia FIT Weight Management System for a test drive. The test drive was 4 weeks long and ran parallel to others test driving it at the same time I was. I was provided with a BodyMedia Armband, which retails for $249, and a one month subscription to the online Activity Manager, which starts at $6.95. Given my history of weight loss in 2007 I am always intrigued and interested in plans and technology that can make that process easier. 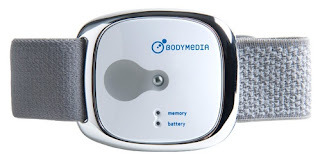 The BodyMedia Armband is a band that is to be worn on your left arm around 23 hours a day so it can measure everything you do, including sleeping. The device is then synchronized to the online Activity Manager which then breaks down everything into charts as far as your calories burned, the steps you took, your different physical activity, and your sleep. Calories consumed can be entered via a daily food log, as well as a daily weight to give you a complete idea of how each day compares against your current goals. I first put the band on two weeks ago today. It is a bit confusing at first because there is no on/off switch. Once the device is charged you just put it on and it turns itself on within 10 minutes. I was hoping it would get easier over time, but I have found it to be very difficult to know if it is actually working or not. It give an audible beep when it turns on or off, but I have found that it is intermittent at best. When it is synchronized it appears to have all the data so it is obviously turning on, but not always notifying me. At first it is very comfortable, and stays put very well. After getting dressed it cannot be seen unless you are wearing a very short sleeved t-shirt. The problem seems to come after it has been worn for about half the day. If you don't touch it, you don't feel it, but if you move it for any reason you can feel the uncomfortable pressure against your skin. I have tried differing tightnesses, almost to the point of it slipping down, and I get the some uncomfortable reaction after about 4-5 hours. The feeling is such that I think with prolonged use it could end up causing sores, or at least very tender skin. With the way it is designed it is not a problem to sleep with. I have not had any issues with it being uncomfortable, even if I sleep on the arm that it is attached to. The only pain associated with it is the uncomfortable reaction I mentioned in the paragraph above. The band leaves a lot to be desired. It is a cloth type band and after running gets very wet as you can imagine. This leaves it uncomfortable to put back on after a shower, and I am sure over time will start to stink really bad. At a replacement cost of $13, this could get really expensive if you run as much as I do. The battery life is excellent. I have only charged it twice since I got it two weeks ago, but the downside is there is no way to tell how much of a charge you have left, or even if it is totally dead, without plugging it into the computer. One nice feature I was not able to take advantage of is the built in Bluetooth. It can be paired with either an Android or an iPhone to get up to the minute stats and also enter your daily food log. Since I have a Blackberry I didn't have this capability, which really made it lose a lot of it's appeal. I couldn't get that immediate feedback, and had to wait till I synchronized at the end of the week to see how it was going. Sure I could have synced daily, but it is too much trouble to take it apart and plug it in to get it synchronized more often. I didn't keep the daily food log, although I did try it out and it was very easy to use. It was quick to look up foods that you have eaten, and add them to the log for the different meals throughout the day. I have logged foods before but I am just not at the point that I want to keep that granular records again. If I had the Android or iPhone App I may be more likely to use this feature, but to remember it to enter it at a later time when I am at a computer is just not convenient enough. So, what is my bottom line? I usually base an over-all product review on if I will keep using the product after the review. As far as the BodyMedia FIT is concerned I just don't see that happening. It is obvious that a lot of time and research went into this product, and it seems to do what it was designed to do, however I believe it is at a price point of $249 that is going to keep it from becoming used widespread. As if the $249 wasn't already high enough, the $12.95 monthly subscription ($6.95 if paid yearly) is also way too high for a service that requires no human intervention from the company. It is a web application which I am sure cost a lot to build, but the pieces of it are very similar to many other free applications on the web. Something that I draw as a close comparison is both the Garmin Connect, and the Nike Plus communities. They are both free services that you use with the products they sell. I understand they are not identical, and are aimed at runners for running data, unlike BodyMedia FIT which tracks all activity, sleep, and food intake, but I am using it as a comparison of similar products that are free to back my thought that the subscription fees are too high, if they should be charged at all. I would never pay this much for a product like this. I lost 90lbs in 2007 without using any fancy devices, and this product doesn't change my mind by being the much needed product. It can give you a lot of data, but most of that data can be tracked with free online tools close enough so that you will know if you are getting enough exercise to offset your calorie intake to give you a weight loss. The only piece that I see as something that cannot be replaced for free is it's ability to track your sleep quality. I understand how important enough sleep is to weight loss, and I struggle with getting enough. I am sure I could (and probably will) be proven wrong, but just getting enough sleep would take care of this problem for most people, and get the rest really close to where they need to be. Sleep quality is important, but a lack of sleep is the more common problem I venture to say. If you have read this far, I thank you. I was asked to blog about this 4 times during the test-drive, but I am going to opt to send the device back instead. It has just not proven to be worth my time to sit down and write about any more than this one time. What do you do for weight loss? Do you have any favorite products, methods, or web apps that you use? Thanks for the honest write up. I was always curious in these type of products. I am like you, I lost my weight (-170) on my own, so i would not want to spend this much money on these type of aids. that cost a lot of bucks, I like the daily food log, since I watch what I eat though sometimes I forget about my diet plans. Thank you for the write-up, Tim! This looks like a good product to get an accurate count of calorie burn (especially outside of exercise). If you add in the food logging, maybe it would be worth some of the $250, except for the stink factor. If it started to smell anything like my Garmin strap - ugh! My DH and I have used www.livestrong.com's Daily Plate application (FREE!) to log our food intake against our caloric burn and it was enlightening to say the least. I think that people (myself included) automatically estimate up on their caloric burn and estimate down on their consumption so a logging service helps keep you honest. Congrats on your 170lb weight loss - that is incredible! It is, and it may be doable if it wasn't for the monthly fee after the fact. Thanks for your input Stephanie! I am not sure if that is the same Daily Plate that was starting when I was losing my weight in 2007. We had a few options back then, but there are many more options out there now - all free!